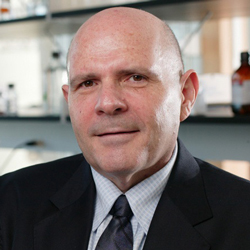 Samuel I. Stupp, the director of the Simpson Querrey Institute for BioNanotechnology at Northwestern University, has received the Soft Matter and Biophysical Chemistry Award from the Royal Society of Chemistry -- the largest organization in Europe dedicated to advancing the chemical sciences. The award is given by the Faraday Division of the Royal Society, which provides a forum for physical and biophysical chemistry, molecular and chemical physics, and theoretical chemistry. The Soft Matter and Biophysical Chemistry Award honors outstanding and innovative research in soft condensed matter and the application of physico-chemical techniques to biological problems. Stupp is receiving this award for his fundamental contributions to the science of supramolecular soft matter and for demonstrating its value to control biophysical interactions with mammalian cells. He will receive a medal during a symposium this year and will undertake a lecture tour in the U.K.
Stupp’s research focuses on the design of soft materials that can signal cells and be used in novel therapies for regenerative medicine. His work has led to the development of materials that mimic the natural structures that surround cells in the human body and activate the necessary signals to initiate the growth of tissues and organs. Using molecularly designed materials, Stupp has demonstrated the possibility of converting neural stem cells into neurons, an important target in finding novel therapies for neurodegenerative diseases, such Alzheimer’s and Parkinson’s diseases. He also has demonstrated the functional efficacy of these materials in treatments for spinal cord injury, as well as their capacity to regenerate tissues, such as bone, cartilage, muscle and blood vessels, among others. The Royal Society of Chemistry was founded in 1841 by a group of academics, industrialists and doctors who understood the power of advancing the chemical sciences. Forty-seven previous winners of the Royal Society of Chemistry’s awards have gone on to win Nobel prizes for their pioneering work, including Harry Kroto, Fred Sanger and Linus Pauling.